Whisper it quietly, but the worm may have turned. Northern Ireland’s golfing journalists retained the Writer Cup in 2017. That’s right, two in row! So long the whipping boys, Team NI has finally found a backbone. The eighth edition of the Writer Cup – the Ryder Cup style event hosted by Tourism NI that pitches Northern Ireland journalists against Republic of Ireland journalists was played at Holywood GC and Royal Belfast GC. While most of the golfing focus in Northern Ireland gravitates towards our classic links venues – Royal Portrush, RCD, Portstewart etc – Belfast can provide a unique golfing experience of its own. Nine-holers, municipal courses, Championship venues – Belfast has pretty much every option available. There’s driving ranges and even an indoor facility – Citi Golf – when the conditions take a turn for the worse. Staying and playing in Belfast means you can make the most of a city that has been branded ‘the best place to visit in 2018’ by top travel guide Lonely Planet. Inspired by the surroundings of Rory McIlroy’s home course, Team NI completed a day one whitewash in the fourballs at Holywood GC to grab a commanding 4-0 lead. The teams were treated to a wonderful evening meal at Belfast’s McHugh’s Bar after which they retreated to their base for the evening, the Hilton Hotel, near the iconic Waterfront Hall. Team ROI had a mountain to climb in the day two singles which were staged at the historic Royal Belfast GC. Needing just two points to retain the title a comfortable victory appeared on the cards for the ‘home’ side. In the end, the outcome was much closer than anyone expected with ROI winning the singles 4.5 to 3.5. It was not enough (thankfully) to prevent Team NI collecting the trophy for the second year in succession by a 7.5 to 4.5 margin. Can they make it a hat-trick of successes in 2018? Holywood GC and Royal Belfast are both situated just outside Belfast within 30 minutes drive of the Hilton Hotel. Holywood GC has recently embarked on an ambitious development plan which will transform the club in the next 18 months. The clubhouse is set for a major upgrade to include new facilities including, a state of the art fitness suite, an indoor golf simulator and entertainment room and a Golf Academy complete with the latest technology. In preparation for these changes, the 18th green has already been moved further away from the clubhouse and remodelled. The course is an 18 hole undulating parkland neighbouring Redburn Country Park. It overlooks the city and Belfast Lough with views that are unrivalled in the area. To score well requires accurate driving as opposed to length and good approach shots are needed to find the greens. Founded in 1881, Royal Belfast Golf Club lays claim to the title of the oldest golf course in Ireland. The present layout dates back to 1925, when responsibility for the design was handed to the now revered course architect Harry Colt. With the assistance of Walker Cup player W.A. Murray, Colt produced a course of great charm which provides a true test of skill and enjoys unrivalled views of Belfast Lough and the Antrim plateau beyond. Royal Belfast is always meticulously maintained with impeccable greens and groves of rhododendrons and gorse providing a colourful backdrop in spring. There is a secluded, timeless feel to the club, one that has attracted the likes of tour players Michael Hoey and Rory McIlroy to play and practice at the venue. At the heart of its varied challenges is the constant requirement for accuracy rather than length, providing all levels of golfer with a fair test of golf. The numerous bunkers and subtly sloped greens ensure that posting a low score is indeed a difficult feat. Robert Moran produced the best round of the day to win the Faldo Series Ireland at Lough Erne Resort by a single shot. The Castle GC member fired an excellent final round of 69 – four shots better than any other player on the day – to book his ticket to the illustrious Faldo Series Grand Final. The competitors battled tough windy conditions at the famed Faldo Course. Two brilliant rounds from the top two players aside, every other golfer posted 72 or over. Moran was off the pace on day one but he hung in until he finally overhauled David Kitt (Athenry) on the 16th hole of the final day. Kitt can count himself incredibly unfortunate not to make the Faldo Series Grand Final. His opening round of 68 was an exhilarating exhibition of golf but his fellow Under-18 competitor Moran was also in sublime form. Rory Williamson (Holywood) came to Lough Erne as the defending Champion. Although unable to defend his title, he won the Under-21 section by three shots. He was also only two shots behind the overall victor. A sumptuous eagle on the difficult ninth hole was the highlight of the day for Williamson who will go to his second Grand Final in September. Emma Forbes (Royal Portrush) will line up in her first Grand Final after winning the Under-21 Girls’ section. Forbes overcame some shaky moments to claim a one-shot victory over Gemma McCarthy (Clonmel). McCarthy finished well but had to eventually settle for runner-up. Anna Foster (Elm Park) edged out Ella Hammond-Baveystock (Wentworth) to win the Girls’ Under-16 category by one shot. Foster birdied the 17th to seal the win and will head to her first Faldo Series Grand Final. Boys’ Under-21: 145 – Rory Williamson (Holywood) 72-73; 148 – Shane McDermott (Cavan) 74-74, Jamie Fletcher (Warrenpoint) 73-75. Boys’ Under-18: 143 – Robert Moran (Castle) 74-69; 144 –David Kitt (Athenry) 68-76. Girls’ Under 21: 165 – Emma Forbes (Royal Portrush) 82-83; 166 – Gemma Mccarthy (Clonmel) 86-80. Girls’ Under-16: 172 – Anna Foster (Elm Park) 88-84; 173 Ella Hammond-Baveystock (Wentworth) 86-87. For full scores and results from the Faldo Series Ireland Championship visit www.faldoseries.com. You can also follow the Faldo Series on Facebook at www.facebook.com/faldoseries and on Twitter atwww.twitter.com/faldoseries. The new Faldo Series season begins at the stunning Lough Erne Resort on April 3-4. Lough Erne will welcome a field brimming with talent for the tenth Faldo Series Ireland Championship with places in the 21st Faldo Series Grand Final awaiting the age group winners. Competitors aged 12 to 21 still have an opportunity to enter the Faldo Series Ireland Championship. Any entrants will be wary of defending champion, Holywood’s Rory Williamson, whose mastery of the conditions in his final round was decisive in winning the tournament in 2016. Irishmen Paddy Culhane and Eoin Murphy have shown form in the Faldo Series and will look to depose Williamson to take the glory for themselves. Around 90 golfers will line up in the tenth Ireland Championship, to be played over two rounds on the Faldo Course at Lough Erne. The field will be divided into five age-groups – three for boys and two for girls – and the winners of each division will again join Faldo at the season-ending 21st Faldo Series Grand Final, a 54-hole World Amateur Golf Ranking event. Today, 40 Faldo Series tournaments take place in 30-plus countries worldwide, touching thousands of golfers each year. Past winners include Major Champions Tseng Ya-ni and Rory McIlroy, who took his tally of professional Major titles to four with his wins at the 2014 Open Championship and US PGA Championship. To enter the Faldo Series go to www.faldoseries.com. For more information on the Faldo Series visit www.nickfaldo.com. You can also follow the Faldo Series on Facebook at www.facebook.com/faldoseries and on Twitter at www.twitter.com/faldoseries. Holywood’s Rory Williamson won the Faldo Series Ireland Championship by a single shot on the Faldo Course. Williamson fired rounds of 71/69 to hold off the fierce challenges of Shane McDermott and Jamie Fletcher, who finished in joint second place overall. The tournament attracted 96 players to the renowned Faldo Course at Lough Erne Golf Resort, with the five category winners qualifying for the 20th Faldo Series Grand Final. Williamson was very satisfied with his final round in particular, his back nine and birdies on 17 and 18 to get him home in 32. The score was made all the more impressive by the pressure being exerted from the chasing pack. Williamson won the Boys’ Under-21 by a single stroke but the Boys’ Under-18 was more conclusive. Peter Cummins (Lurgan) has showcased his talent in the Faldo Series previously, and so it was again as he shot 75/70 to win by four strokes. Cummins was able to seize the birdie chances on the back nine to post a great score on the testing Faldo Designed layout. Eoin Murphy (Dundalk) was the victor in the Boys’ Under-16 division. He claimed the spoils by four shots over Conor Glennon (Glasson). Murphy’s rounds of 74/70 at such a venue will fill him with confidence. Murphy’s efforts also grant him qualification to his first Faldo Series Grand Final. The Girls’ Under-21 category was claimed by Mary Doyle (The Heath) by five shots over Maeve Cummins. Doyle was able to lead from start to finish in rounds of 74/77. The Girls’ Under 16 division was a closer affair as Anna Foster of Elm Park edged out Kate Dwyer by a single shot. Foster headed home in 33 on the final day to take the glory. Both Doyle and Foster qualified for the Grand Final later this year. Today, 40 Faldo Series tournaments take place in 30-plus countries worldwide, touching thousands of golfers each year. Past winners include Major Champions Tseng Ya-ni and Rory McIlroy, who took his tally of professional Major titles to four with his wins at the 2014 Open Championship and US PGA Championship. Leading final scores: Boys’ Under-21: 140 – Rory Williamson (Holywood) 71-69; 141–Shane McDermott (Cavan Golf Club) 72-69, Jamie Richard Fletcher (Warrenpoint) 70-71. Boys’ Under 18: 145 – Peter Cummins (Lurgan) 75-70; 149 – Paddy Culhane (Galway GC) 74-75, Robert Moran (Castle) 75-74. Boys’ Under 16: 144 – Eoin Murphy (Dundalk) 74-70; 148 – Conor Glennon (Glasson) 72-76. Girls’ Under 21: 151 – Mary Doyle (The Heath) 74-77; 156 – Maeve Cummins (Lurgan) 79-77. Girls’ Under 16: 169 – Anna Foster (Elm Park) 93-76; 170 – Kate Dwyer (Rossmore) 85-85. Rory McIlroy is urging golf clubs across Ireland to embrace this year’s Dubai Duty Free Irish Open hosted by the Rory Foundation and help make it one of ‘the best ever’. “The Irish Open has always been very close to my heart but I would love this year’s event to be even more special as it will once again be hosted by the Rory Foundation,” said Rory. Rory is fiercely proud of where he comes from and has been a great ambassador for Irish golf. Now he’s determined to maintain the Irish Open’s position as one of the premier events on the European Tour. The Holywood golfer has produced a ‘five point plan’ to help clubs and their members to get involved in the tournament which takes place at The K Club in Co. Kildare from May 19-22. A portion of all tickets sales this year will go towards the Foundation which was established by McIlroy in 2013 to help children live better lives by raising funds and offering support to children’s charities around the world. This year will also be the first time that The K Club will host Ireland’s national Open, fittingly on the 10th anniversary of the course hosting Europe’s memorable victory over the USA in the 2006 Ryder Cup. Title sponsor Dubai Duty Free is offering one lucky team from an Irish golf club the unique opportunity to play in this year’s Pro-Am. So Rory, in conjunction with the Golfing Union of Ireland (GUI) and Irish Ladies Golf Union (ILGU), is asking all clubs in Ireland, north and south, to use existing competitions to find a Men’s and Ladies’ champion (Junior members also eligible to compete) to represent their club in regional qualifiers in late April with a national final to be held on the Smurfit Course at The K Club in early May. The overall winning team, which will also include an official nominated by the winning club, will receive a team invitation to compete alongside a top professional in the Dubai Duty Free Irish Open Pro-Am. Full details on how to enter will be available at www.golfnet.ie. To encourage young golfers to be the best that they can be, Rory has teamed up with Confederation of Golf in Ireland (CGI) and The European Tour to encourage golf clubs to take part in this competition which is designed to help children under the age of 15 to develop their Putting, Chipping, Iron Play and Driving skills in a team environment. Rory is asking every club in the Republic of Ireland and Northern Ireland to enter an U15 Boys’ team and an U15 Girls’ team in the provincial qualifiers, with four players per team – each specialising in one of the four particular skills. The four individual skill scores are combined to make up a final team score and the winning team from the national final will win a unique ‘meet and greet’ opportunity with a top player at this year’s Dubai Duty Free Irish Open Pro-Am. Full details on how to enter will be available at www.golfnet.ie. One of Rory’s key aims this year is to encourage children who have never picked up a club to take an interest in golf. So he has joined forces with the CGI to develop an exciting new schools programme called Get Into Golf With Rory. Throughout the country, more than 30 clubs have been selected to run a five-week primary school coaching programme with follow-on activities and membership packages. Schools have yet to be selected but the overall aim of the programme is to offer thousands of primary school pupils the opportunity to get their first taste of golf and create a pathway to continue golf in their local golf club. Full details on the Get Into Golf With Rory programme will be available at www.golfnet.ie. From his early days at Holywood Golf Club, Rory has always loved the camaraderie and community spirit of golf clubs so this year he is encouraging clubs to enjoy the Dubai Duty Free Irish Open experience as a club. To help with this, the European Tour and Rory have created a number of special ticket and coach offers that are exclusive to golf clubs. So hop on board – and why not bring the family too for a great day out! What’s more, Rory will give the top four clubs who bring the most members as a group a personally signed Pin Flag to proudly display in their clubhouse! Details on how clubs can travel as a group to this year’s Irish Open will be available at www.dubaidutyfreeirishopen.com. It takes someone very special to bring these ideas together for the club so Rory is asking every golf club in Ireland to nominate one individual as its Dubai Duty Free Irish Open Ambassador who will be the main point of contact for all of these proposed club initiatives – and all things relating to the Dubai Duty Free Irish Open. Clubs wanting to nominate their Ambassador should email kate@cgigolf.org. Swan Golf Designs is putting on a bit of Holywood glamour as it approaches the completion of the latest development stage of Rory McIlroy’s home course in Northern Ireland. Howard Swan, from the family-owned, Suffolk-based architectural practice, first went to Holywood some 15 years ago when the four-time Major winner was still a junior, practising endlessly at the course and honing his skills. The renovation of the parkland golf course – which sits on the North Down escarpment of Belfast Lough – began all those years ago and has steadily built momentum to result in the quite excellent course of today. The club has prospered in recent years because of a much greater visitor interest heightened by McIlroy’s rise to prominence, and, consequently, it now boasts a museum and exhibition about him. There has been a significant increase in the number of green fees with many Americans adding Holywood to their itineraries and this has meant the course’s improvement programme has sustained, allowing the Swans to return regularly to continue their redesign work. Swan said: “The course is laid out over only about 100 acres, which is small in modern-day terms, and the holes are tightly contained on the lower and higher plateaux of the land. “One of our major challenges has been to ensure golf can be played there safely and we have been making modifications to the layout in order to improve this aspect of its design. The club has been very vigilant about the historical importance, and the sensitivity, of the 1904 design – it seems likely that James Braid was there at some time – in terms of ensuring that dangers of escaping balls were kept to a minimum, as there is housing and a busy public road bordering the course. McIlroy’s legacy has allowed the Swans to continue their work at Holywood: a new sixth hole has been provided this year, with work ongoing on the bunkering and reorientation of the seventh and eighth. All of which is helping the club push on with its long-term improvement programme and also to sustain its reputation as one of the country’s most progressive and successful clubs. SGD is an independent and professional golf course architecture firm with a track record of providing clients with successful design solutions on golf course projects for more than 50 years. JESSICA Carty made full use of ‘home’ advantage to the win the Ulster Women’s Championship at a wet and windy Belvoir Park GC. 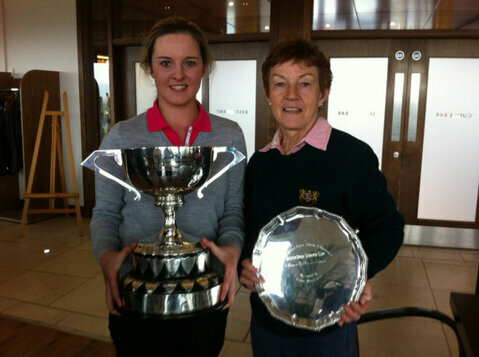 The 18-year-old student held off the challenge from Lurgan’s Niamh McSherry to claim her first ‘senior’ title by 4&3. “It was a tough week with Belvoir playing very long so I think a wee bit of local knowledge was important,” said the Irish international. Carty’s home club is actually Holywood GC, famous as the breeding ground for one Rory McIlroy, but she also retains a membership at Belvoir. With a small field, less than 30 entrants, Carty, who won the Irish Girls’ Championship last year, entered the tournament as one of the favourites alongside Louise Coffey (Malone), Laura Grant (Lisburn) and experienced international Lucy Simpson (Massereene). Having qualified in third place, she beat Zoe Allen (Lurgan), Niamh Ward (Lurgan) and then Chloe Weir (Shandon Park) on the 19th in the semi-finals to book her place in the final against McSherry. “The matches against Niamh and Chloe were tough. I didn’t play that well against Chloe in the semi-final but I just hung in to finally beat her,” added Jessica who will take up a golf scholarship at the University of Denver in the autumn. PAUL Gray, the Club Manager at Holywood GC, is preparing for a 350 mile cycle challenge in aid of Marie Curie Cancer Care. Last November a friend of Paul’s, Cois Beukes (35), lost his 10-month battle with a rare and aggressive form of cancer, leaving behind a wife and young daughter. “Cois proved to be an inspiration throughout his life and, through his passion and involvement with rugby as a player and a coach, he had an incredible way of caring for others,” said Gray. The Cois Beukes 3 Nations Cycle Challenge will be held in May and will take four days to complete as it winds it’s way through Wales, England and Ireland. The route is planned to mirror the journey that Cois took when he first moved from South Africa to Cardiff. “Two of the four days will be spent cycling up to 100 miles per day through the Brecon Beacons and Snowdonia national parks. Those are areas that I believe have the odd hill,” cracks Paul. Twenty people have signed up to take part in the sponsored charity cycle, including Belvoir Park assistant Will Carey. However, Gray is looking for many more people, including fellow professionals, to take part as the target set is £70,000. Anyone who is interested in donating can do so on line at http://www.justgiving.com/coiscycle. A fund raising event will also be held at Holywood Golf Club on Saturday, April 16. Tickets are £10 each and available from Paul Gray at 028 90423135 or e-mail paulgray@holywoodgolfclub.co.uk.